Key features include a 2 inch LCD monitor for viewing content, audio levels, tape information, and user menu selection, time code generator and I/O, 4 channel audio control, i.LINK IEEE-1394 connection, Component Video I/O, RS-422A, RS-232C and Control S remote control interfaces. 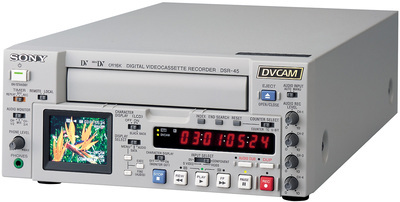 This front-loading VTR accepts both standard and mini-size cassettes, and its half-rack design allows the DSR-45 to be easily integrated into existing linear and non-linear editing systems. Rent the Sony DSR-45 Compact DVCAM / DV VTR from Deck Hand Camera Rentals Today!